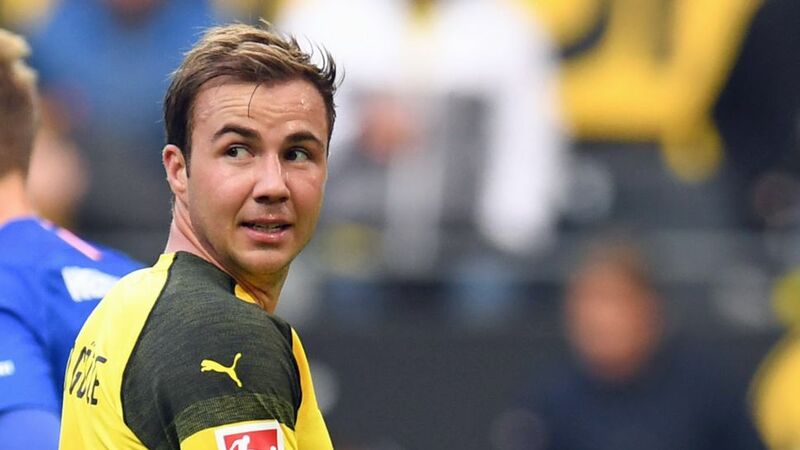 For the first time this season, Mario Götze was in the Borussia Dortmund starting XI for a Bundesliga fixture, catching the eye in their 2-2 draw with Hertha Berlin. The 26-year-old followed up his first 90-minute outing of the season in Dortmund's impressive 4-0 UEFA Champions League win over Atletico Madrid in midweek with another start on Saturday, and his coach Lucien Favre was the first to sing his praises after seeing his faith repaid. "He moves around really well and has a feel for football; he has the solutions for our game," enthused the Swiss coach, before Götze took centre stage again, in front of the microphones. Question: Mario Götze, you've only got one point out of the game – there was more in it for Dortmund, wasn't there? Mario Götze: (smiles) Of course. We could have got two more points. In view of how the game went, and if you think that we conceded a penalty in the 90th minute after having wasted so many good chances ourselves, then you can't be 100 per cent happy. We were very effective in our previous games and scored quick goals, but we didn't manage that today and we've only got ourselves to blame. Question: You set up a goal for Jadon Sancho – did it cross your mind to shoot for yourself? Götze: I did actually think about shooting to begin with, but there were three of us against one Hertha defender and so it was quite easy for me to lay the ball off. I waited for the very last moment to play the ball, otherwise it would have been too late. Götze: It's not all about that, though. We're defending well, we're trying to create chances as a team and that is the thing we're doing best at the moment. We're working well as a team and then of course we're increasing the tempo in our game at the right moment to create chances to score. Question: You have now started two games in a row – first against Atletico and now against Hertha. Are you happy about that? Götze: Of course I'm happy, and I'm also pretty chuffed with the way we're playing too. Let's not forget that Berlin are very strong opponents and played with five at the back. We nevertheless managed to create many good chances, it's just we didn't score the goals this time. Götze: (smiles) So I've made it – I'm back at 100 per cent! No, to be honest there's still a bit more in the tank, but I'm feeling very, very good. Question: This was your second game in the so-called 'nine-and-a-half' position. It's not particularly your favourite position, or is it slowly becoming it? Götze: It all comes down to how you play this role. If it's expected of me to stand up top and score goals with my head, then it's going to be tough, but the way we're playing, I can certainly take a liking to it. If we keep switching the game so smoothly and if the play comes in from out wide, or Marco [Reus] is supporting from the number ten position, and if we can make deep runs and swap positions the way we have been doing, then it's a great thing.